As far as telling the real story about rodeo, SHARK has been telling that for the last 17 years, and it is a story of cruelty, cowardice and corruption. There is apparent trouble in the rodeo mafia, and it couldn't happen to a more deserving bunch. SHARK's more than 160 YouTube videos are educating the world about the cruelty of rodeo. Even a number of rodeo people are getting the message, and that bodes very poorly for the thugs running the rodeo mafia. Now we are really starting to see the fruits of our efforts. The Professional Rodeo Cowboys Association (PRCA) has long bragged about being broadcast on ESPN. What the PRCA didn't bother mentioning was that it was paying for every minute of it. While legitimate sports associations are paid for allowing television stations the privilege of airing their games, rodeos pay to be seen. The PRCA didn't just pay - it paid a fortune. It paid such a fortune in fact, that it can't afford to pay it anymore, at least not for ESPN. As of 2011, the PRCA will pay to appear on the "Great American Country" cable channel. You are forgiven for having just exclaimed, "the what?" The Great American County channel is much, much smaller, and won't cost nearly as much as ESPN. With this move, the rodeo world admits that it isn't what it claims to be - "the next big thing." Not by a very long shot. The fact is, rodeo thugs have been claiming that they are the "next big thing" since the beginning of rodeo. It wasn't true then, and it most certainly is not true now. SHARK has been saying that all along. Now, through its action, the PRCA finally admits it as well. Rodeo thugs are predictably trying to spin the story of their move from ESPN. PRCA Commissioner Karl Stressman claims, "We will now have more creative control to tell the real story of rodeo." Nonsense. The PRCA paid to have its abuse aired, and it completely controlled its shows. This included editing out animals being shocked, injured and killed. It's too bad that ESPN chose to allow abuse on its channel just to improve its bottom line. Got ethics, ESPN? Apparently not. 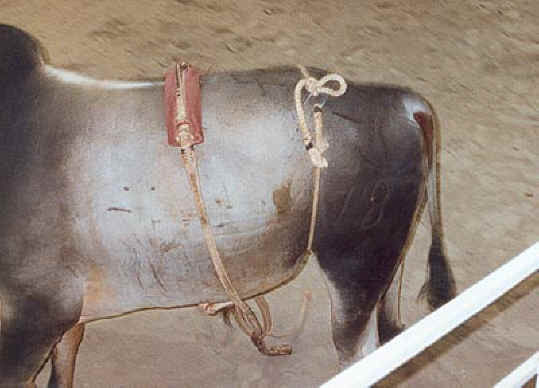 Notice how tightly the flank or bucking strap is tied. In a stunning loss for the PRCA, the Houston Rodeo, one of the world's largest rodeos, has withdrawn from PRCA sanctioning. This indicates a drop in the value of being associated with the PRCA. This is a major upset for the world's largest rodeo association, especially given that a number of its other major rodeos, including Greeley in Colorado and Cheyenne in Wyoming, are losing money and face uncertain futures. 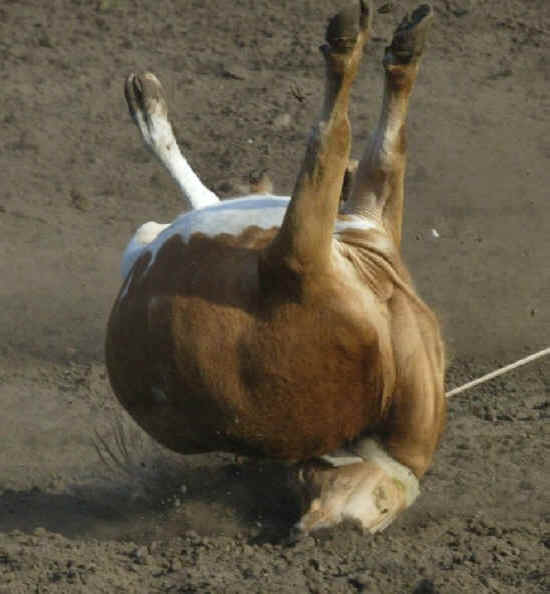 The way this calf's head is sliding along the ground, doubled over the back with the body above, it is obvious that this calf is in pain, if not being seriously injured. I predict there will be more defections, more financial issues, and more defunct rodeos as people continue to learn about rodeo animal abuse. In that regard, I believe 2011 is going to be a very good year.